You don’t come across many people who experience worrying adverse reactions to the bite of man’s worst enemy, the mosquito. And it’s certainly not something that captures public attention in the same way a shark bite might, although mosquitoes are statistically much deadlier to humans than sharks. In fact, they are the deadliest animals on the planet, with a record 1 million deaths a year being attributed to the irksome insects. There are several types of allergic reactions mosquitoes can inflict on their unsuspecting victims, and some of them are blood-curdling, to say the least. Reactions are classified as minor or large localized reactions and systemic reactions. Minor localized reactions are those which subside after a few days and involve little discomfort. Large localized reactions trigger other symptoms, such as rashes, itching, nausea and swelling of the joints. Systemic reactions are life-threatening and require medical attention immediately, as they may cause anaphylaxis. Skeeter Syndrome is an example of systemic reaction, along with asthma, tachycardia, dizziness, dysphagia and confusion. A physical reaction which becomes visible immediately and progresses from slight inflammation to swelling, blistering, itching, infection and occasionally even anaphylactic shock, asthma or cellulitis, Skeeter Syndrome is the extreme version of the mosquito allergy. An unsightly blister can pop up and an even unsightlier liquid can ooze out of it. As if that weren’t enough, fever will take hold of the sufferer, especially if an infection sets in. The area around the mosquito bite stiffens and feels hot to the touch. It goes without saying that Skeeter Syndrome patients also suffer from general malaise. In some cases, an entire limb can swell up. If the reaction is delayed and people are not aware of the cause, an untrained eye could mistake the condition for a bee sting reaction. It seems that this is one syndrome that likes to pock on the vulnerable. Toddlers, children and seniors are prone to this condition. Aside from preventing exposure to mosquitoes and avoiding bites with repellents, either DEET-based or herbal, there’s very little that can be done to prevent the onset of Skeeter Syndrome. Unfortunately, there are no proven solutions for stopping the swelling. After-bite ointments can be applied to stop the itch, but the symptoms would usually subside on their own in a day or so. An asthmatic reaction comes with various symptoms, and some of the most common are wheezing, coughing and chest tightness. The lining of a sufferer’s airways constricts, narrowing the respiratory channels. If avoiding mosquito bites is impossible, then immunotherapy should be considered. Hives, in layman’s terms, urticaria and its associated swelling (angioedema) can last for up to six weeks in acute reactions, or much more than that in chronic sufferers. Antihistamines are administered orally to alleviate the symptoms, and when necessary, corticosteroids or epinephrine may be given. While most individuals experience some degree of allergic reaction with redness and itching, those who experience Anaphylaxis can be brought on the brink of death within minutes. This is a serious allergic reaction with a wide array of symptoms ranging from low blood pressure to lymphangitis (lymphatic inflammations) and throat swelling. As opposed to Skeeter Syndrome, Anaphylaxis causes a burning sensation to take over the patient, not an itch. The reaction to a mosquito bite is similar to that of a bee sting for someone who is hypersensitive to the antigens in the bee’s saliva. 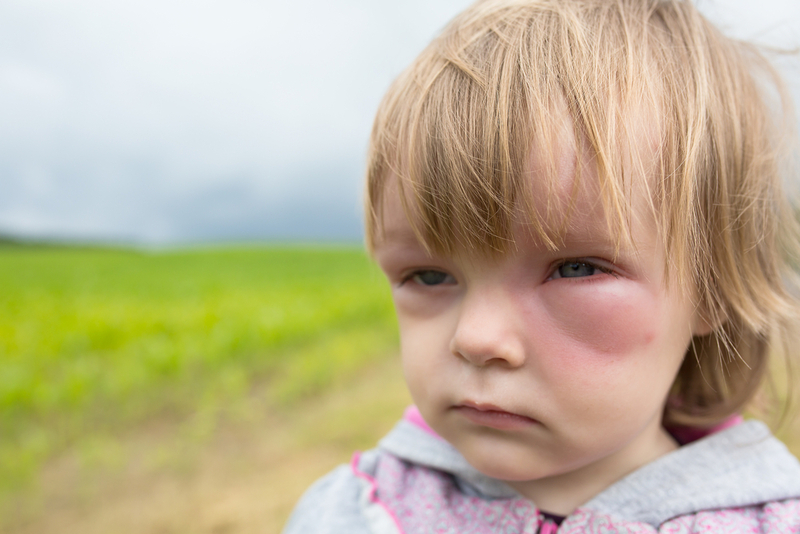 Anaphylaxis can take over instantly, and in extreme cases, the limbs can double in size and the eyes swell up to the point where they can’t be opened. Therefore, the individual is not only immobilized, but unable to see, as well. Conventionally, sufferers are given allergy shots with mosquito extract, much like venom would be used to prevent a snake bite’s effects from spreading. They say blood is thicker than water, and that’s a scientific fact. It works in our favor when it comes to transporting essential elements where they’re needed most. However, it’s also what leads to the bite swelling. Human blood is so think that mosquitoes can’t siphon it. They first need to inject their homebrewn thinning agent into the bloodstream: saliva. The polypeptides in this secretion are the substances which triggers a reaction from our immune system. It can be an instant reaction, or it can develop over the course of 48 hours. People can have this reaction to mosquito bites since birth, or they can develop it. The reason is as yet unknown, but thought to be connected to the autoimmune reaction the body develops toward the enzymes in the saliva. And because mosquito saliva is so different from one species to the next, some bites could result in a reaction, others might not. Oral antihistamines, topical corticosteroids (hydrocortisone cream, for instance) and natural remedies can help alleviate some of the discomfort. Oral antihistamines can be taken before being exposed to mosquitoes, to reduce the local reactions. Allergy shots should be given if the sufferer developed Anaphilaxis. More on treating mosquito bites here! Once the female mosquito uses its syringe-like proboscis to draw blood, it can also transmit malaria, yellow fever, dengue fever, West Nile virus etc. If severe headache, infection, body aches, fatigue, photo-sensitivity, meningitis and neurological changes, such as partial muscle weakness, are displayed in an individual who’s been bitten by a mosquito, it would be advisable to consult a physician. Even if the future seems bleak for someone who is allergic to mosquito bites, there is hope at the end of the tunnel. Not only are more and more repellents being dished out by the day, some of which are herbal products, and as eco-friendly as currently possible, but alternative methods of preventing and treating mosquito stings are being developed as we speak. Ingenious devices and contraptions have been designed, and hopefully, they will be lightweight and portable even for children in only a matter of years.